Later this week my work is having an Associate Summer Party. The theme is beach/luau. So of course I turned to Pinterest to help with decorating ideas. The first thing that I wanted to try was this paper umbrella wreath from Family Chic. All this project requires are two items – paper umbrellas (I purchased mine from Oriental Trading) & a foam wreath (I picked a few up from AC Moore). So simple! I really liked how Camilla had various size umbrellas in her wreath. However, I couldn’t find any larger umbrellas in the few stores that I tried (Target, Dollar Tree, & AC Moore) and with the party this Friday, I don’t have enough time to order them online. 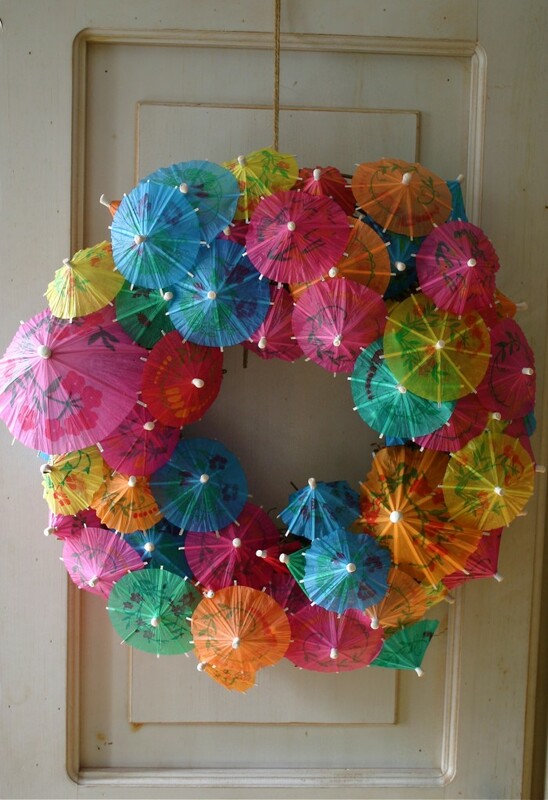 To assemble, all you have to do is stick the umbrellas in the wreath! No glue required. At first I was a bit concerned. The wreath looked sad, but as I added more and more umbrellas, it really started to fill in and look nice. I tried to vary the heights of the umbrellas but the foam was very thin so I didn’t have much room to play around. Right after I snapped the above picture, I tied a ribbon around the wreath so that I could hang it later. Such an easy project – and so cute! To give you some perspective on the size of the wreath, here it is hanging on a closet door. I had 144 umbrellas which were enough to make 2 wreaths with a few umbrellas left over. I plan on having the wreaths hung on the double doors entering the room of the party. Unfortunately, even though I’m planning the event, I am unable to attend. So I won’t be able to take any pictures at the actual party. Stay tuned, because I have a few other things pinned that I’m hoping to try for this party. I'm so excited to try this...looks so cute!